Nové Zámky is a former imperial fortress that was built in the sixteenth century and retained its specific character until the nineteenth century. Until 1840, when the town opened fully for Jewish settlement, Jews were permitted to attend local markets but were not allowed to stay overnight. Once the residency ban was lifted, however, the community developed quickly and by 1869 numbered 1,205 Jews. At first, the Nové Zámky community was served by the rabbinate in Šurany. Later, these ties were broken, and the community joined the Neolog movement. This break was exemplified in the 1860s, when the Jews in Nové Zámky built an elegant, new synagogue whose bimah was set against the eastern wall of the sanctuary, in contrast to Orthodox Jewish practice, which places it in the center. In the wake of these developments, the traditionalist minority established a separate Orthodox congregation and built its own synagogue in 1880. About 2,500 Jews lived in Nové Zámky in 1938, when the city was occupied by Hungary. In May 1944 the Nazis established a ghetto there, where Jews from the surrounding area also were concentrated. The final blow in the destruction of Jewish life came on June 10-12, 1944, when two transports left the city for Auschwitz. 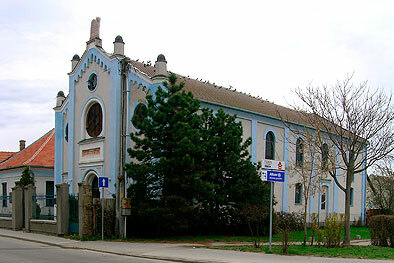 The Neolog synagogue was heavily damaged during the bombing of Nové Zámky in March 1945 and later was razed. The Orthodox synagogue survives intact and is still used a Jewish house of worship. Located on the site of the historic town fortifications, the synagogue forms part of a Jewish communal compound. It is considered a local heritage site, and the Rundbogenstil façade is illuminated at night. The original interior has been preserved, with the bimah placed strictly in the center and the women’s gallery supported by cast-iron columns along three sides of the sanctuary. The compound is marked as part of the Slovak Jewish Heritage Route, and several Holocaust memorials can also be seen. In 1992 a plaque designed by Michal Kern was unveiled on the outer wall, and in 1999 the Jewish community installed 19 plaques in the synagogue interior listing 2,300 Holocaust victims. One memorial plaque is dedicated the Swedish diplomat Raoul Wallenberg, who saved thousands of Jews in Budapest. The most recent Holocaust memorial was erected by the Municipality in a park located next to the synagogue. The Jewish Community of Nové Zámky has about 50 members. A small exhibition of local Jewish history may be viewed in a seminar room that forms part of the Jewish compound opposite the synagogue. There is also a Jewish cemetery in Nové Zámky.